This was Martin Belam’s blog about user experience, information architecture, journalism and digital media. 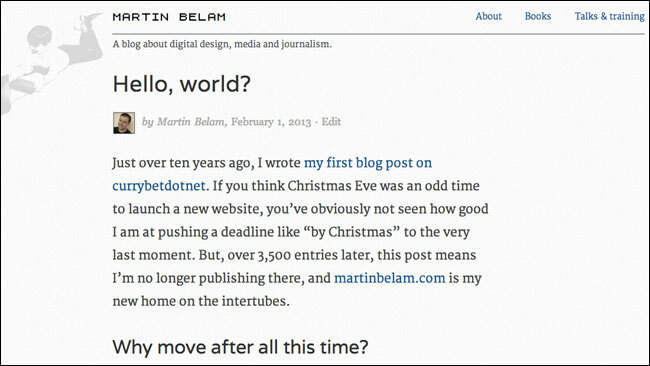 Now you can find me at martinbelam.com instead. After ten years, this is the last blog post on currybetdotnet. It started on Christmas Eve ten years ago, with “Danny Sullivan interview - and Google’s Xmas turkey”, and has survived several re-designs, server crashes, country moves and job changes. I’ll be blogging about much the same sort of stuff over on a new site, just with some neater templates, Wordpress behind the scenes, and no need to worry as an information architect about why Flickr and Tour de France ended up as categories on here, yet the Financial Times and Twitter didn’t.